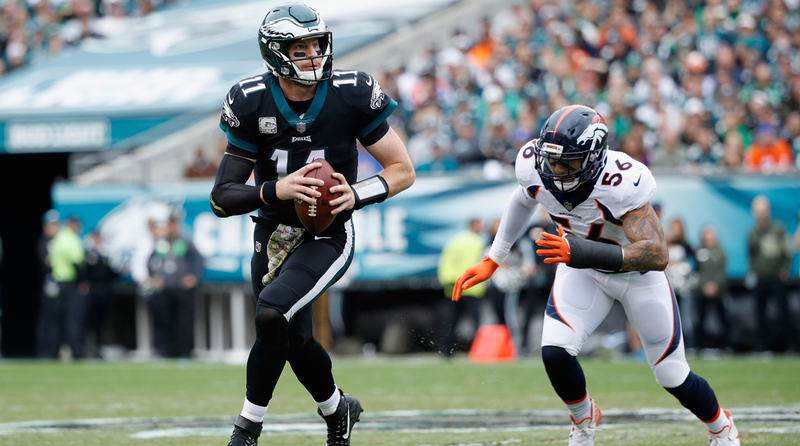 Carson Wentz threw four touchdown passes in leading the Eagles to a 51-23 win over the Broncos on Sunday. Philadelphia has the best record in the NFL at 8-1. Starting this week at the season’s midpoint, and continuing through Week 17, I’ll give you my top candidates for the Most Valuable Player award. A couple things to note: Number six this week could be number two next week; it’s pretty close at the top. And you’ll notice I have a player out for the season in the top five. That’s because I think Deshaun Watson was pretty special in his six starts. 1. Carson Wentz, QB, Philadelphia. Wentz, Brady. Brady, Wentz. Can’t go wrong either way. The Eagles have the best record in football, and Wentz has had dominating games against one excellent defense (Denver’s, on Sunday) and a good one, Washington’s. Wentz led Philly to 85 against Denver and Washington in the past three weeks. He has the NFL lead in touchdown passes (23), and he’s second in yards and third in rating. Perfect example of his impact: Against Denver, he rolled right and, with Von Miller in his face, threw 32 yards down the right sideline perfectly for Alshon Jeffery for a touchdown—with Pro Bowl cornerback Aqib Talib in tight coverage. Wentz has been making these types of plays all season. 2. Tom Brady, QB, New England. The ageless one is as good as ever, and that’s not hyberbolic. By the way, Brady’s regular-season touchdown and interception numbers since the start of 2016: 20 games, 44 touchdowns, four interceptions. This year Brady has survived an injury to Julian Edelman and gotten hit as much as any recent season, but the Patriots are 6-1 since that opening debacle loss to the Chiefs. It’s on Brady. 3. Alex Smith, QB, Kansas City. Amazing to see this man with the dinking-and-dunking reputation entering Week 9 leading the NFL with an 8.4-yards-per-attempt average. Smith has become a good downfield thrower with a healthy Tyreek Hill to target. Smith is a legit MVP candidate … if the Chiefs can stay atop their division. He went until the fourth quarter of Week 9 before he threw his first interception of the season. 4. Russell Wilson, QB, Seattle. Wilson belongs in this group because of the success he has had with the worst offensive line in football, and with the shaky nature of the running game. Wilson didn’t play as well Sunday in the loss to Washington, but he still had enough at the end to put the Seahawks in position to win with the TD toss to Doug Baldwin with less than two minutes to play. If the line play and running game improve, Wilson could easily move up this list. 5. Deshaun Watson, QB, Houston. I know what you’re saying: out for the year, they were 3-4 when he played, can’t have him over Aaron Rodgers. Yes I can. In his six starts, Watson led the Texans to 13, 33, 57, 34, 33 and 38 points, the final game the incredible showdown against Wilson in which Watson twice threw touchdown passes to take fourth-quarter leads. Throwing for 402 at Seattle? That’s enough for me to put Watson here. But unfortunate reality check coming soon: Can't win my vote when you start six games. 12. Ezekiel Elliott, RB, Dallas. • Subscribe to The MMQB newsletter. Get “The Morning Huddle” delivered to your inbox first thing each weekday, by going here and checking The MMQB newsletter box. Start your day with the best of the NFL, from The MMQB.